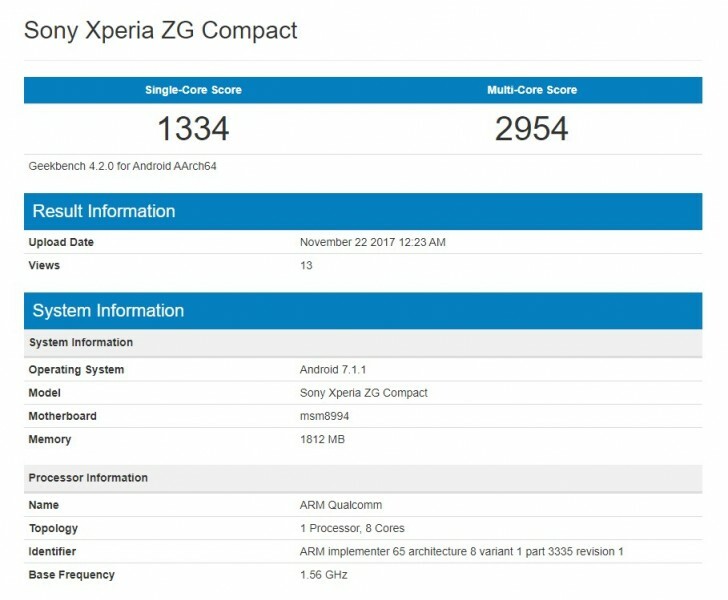 Back in August, several Sony Xperia ZG Compact listings appeared in the Geekbench database. Now, the phone makes another appearance with slightly different scores. Both scores are a bit lower than the results in August, and a lot lower than the Xperia Z5 Compact results with Snapdragon 810 from 2015. It is highly unlikely Sony is building a phone with such an old chipset, especially when the Xperia XZ1 Compact came out in August with Snapdragon 835. There are two possible explanations for this. For one, the device name may have been falsified and all of this is just someone feeding fans false hopes. Alternatively, this could be a device of lower standing, compared to the XZ1 Compact, and so it's running older hardware. Smart money is on the first version, but you never know. Shoutout to Andras Petnehazy for the tip! I think Sony dont bragging like samsung. Sony making smartphone without highlight any features that not yet confirm but samsung highlight everything but still not coming yet.